The PREPSKILLS® full-length, online SAT CompuTest is designed for those students currently in grades nine to twelve. The SAT CompuTest mimics the official SAT experience and provides students with an excellent opportunity for determining what their score would be (on a scale ranging from 600 to 1600) prior to taking the official exam. The PREPSKILLS® full-length, online SAT CompuTest is designed for those students currently in grades nine to twelve. 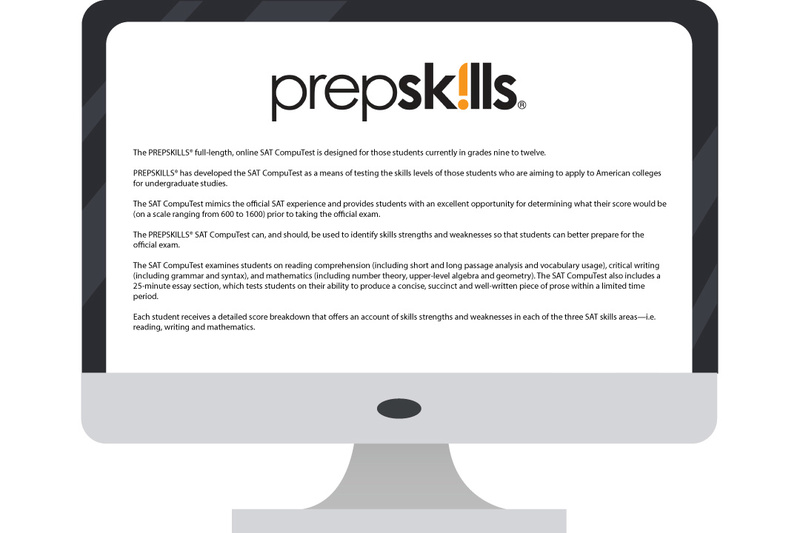 PREPSKILLS® has developed the SAT CompuTest as a means of testing the skills levels of those students who are aiming to apply to American colleges for undergraduate studies. The SAT CompuTest mimics the official SAT experience and provides students with an excellent opportunity for determining what their score would be (on a scale ranging from 600 to 1600) prior to taking the official exam. The PREPSKILLS® SAT CompuTest can, and should, be used to identify skills strengths and weaknesses so that students can better prepare for the official exam. The SAT CompuTest examines students on reading comprehension (including short and long passage analysis and vocabulary usage), critical writing (including grammar and syntax), and mathematics (including number theory, upper-level algebra and geometry). The SAT CompuTest also includes a 25-minute essay section, which tests students on their ability to produce a concise, succinct and well-written piece of prose within a limited time period. Each student receives a detailed score breakdown that offers an account of skills strengths and weaknesses in each of the three SAT skills areas—i.e. reading, writing and mathematics.